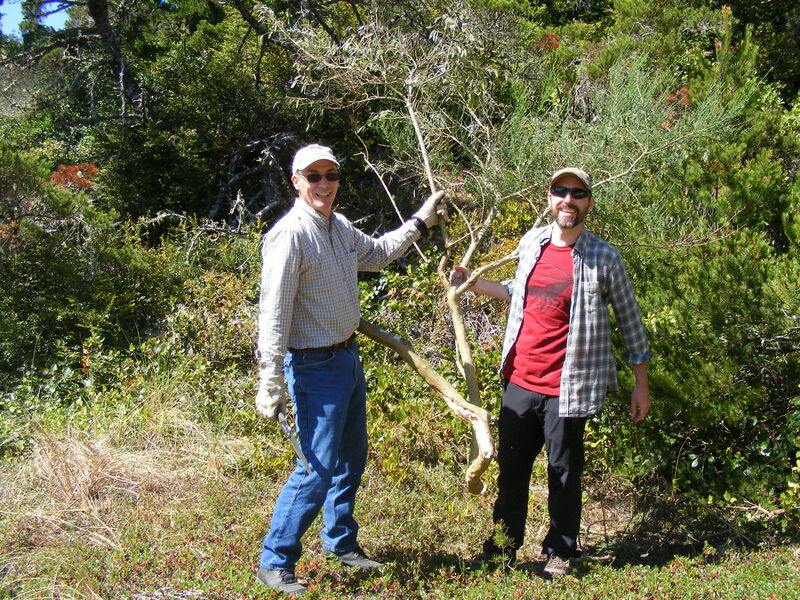 Join Oregon Dunes Restoration Collaboration volunteers in removing gorse plants from Heceta Dunes. We will meet at the east end of Joshua Lane at 10:00 a.m. We will work until roughly 12:30 p.m. and be back to the vehicles by 1:00. You are welcome to leave early or work longer. 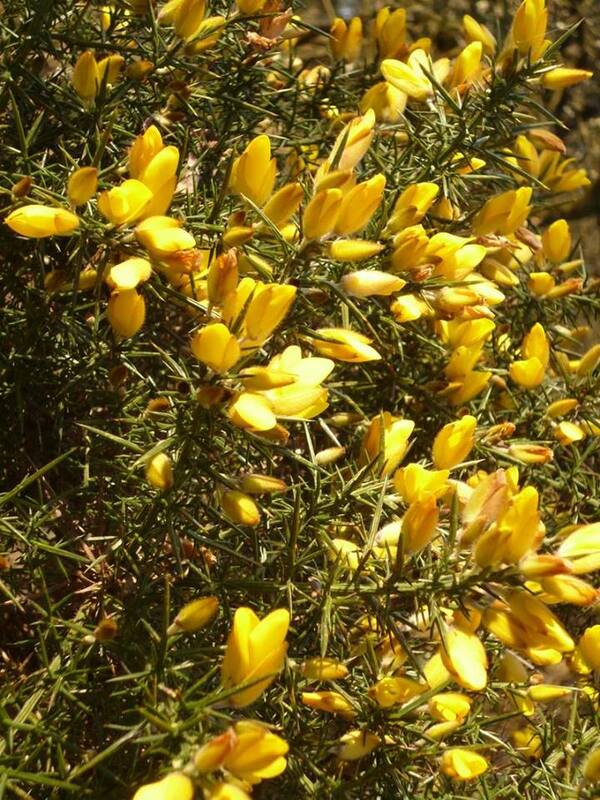 The gorse plants are near the eastern sand sheet, so we will be walking about 20 to 30 minutes to get there. It is mostly level ground but there are a couple of dunes to cross. Join SOLVE and thousands of volunteers this March as we clean up litter and marine debris from the entire Oregon coast! Since 1986, this home-grown tradition of twice-yearly beach cleanups has benefited people and wildlife alike, supporting clean seas and healthy communities. This is a family-friendly event and SOLVE invites all Oregonians to participate. Join the Oregon Dunes Restoration Collaborative to cut and pull Scotch broom at Waxmyrtle Campground from 10:00 to noon. The work site ranges from level to moderately sloped terrain. The bridge to the campground is closed due to railings being replaced, so let's meet at the Lagoon Campground trailhead at 10AM. It is just a short walk to the Waxmyrtle Campground. 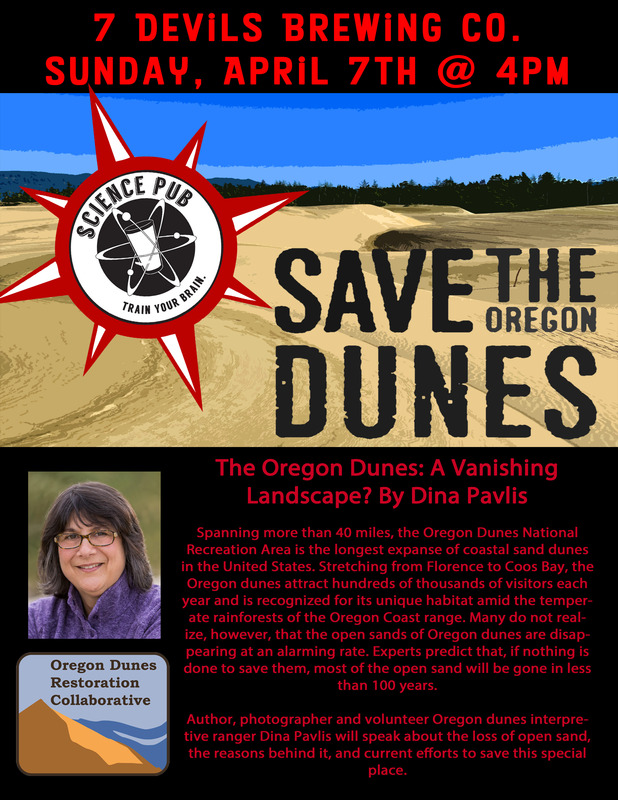 Pub Talk at 7 Devils Brewing Co.
ODRC Educator Dina Pavlis will be giving an informative presentation about the Oregon Dunes at 7 Devils Brewing Company in Coos Bay. Join Dina for a talk about the geology, history, plants and animals of the dunes, why they are being threatened, and what is being done to protect and restore the dunes. Join the Oregon Dunes Restoration Collaborative and members of the University of Oregon's RARE (Resource Assistance for Rural Environments) program for our Earth Day volunteer work party. 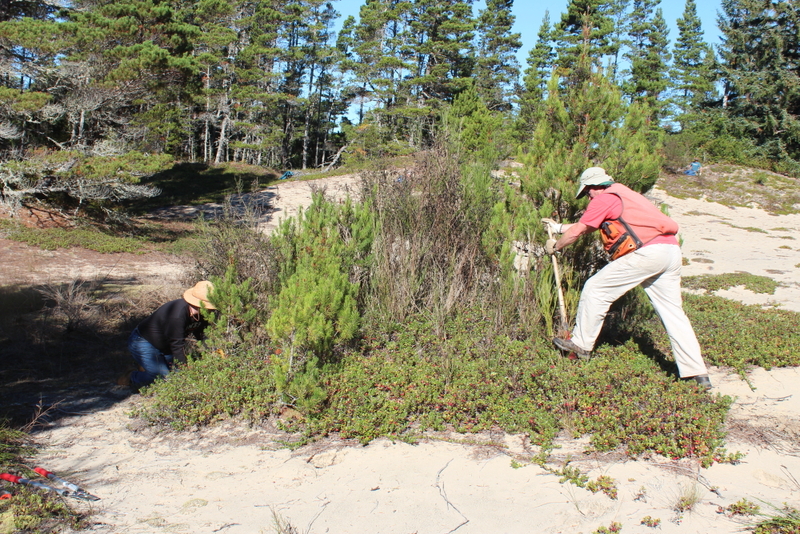 We will be cutting and pulling Scotch broom from the John Dellenback trail and dunes from 10:00 AM to 1:00 PM. BRING: shovels or spades, loppers, tree saws, gloves, rain gear (just in case), a sweatshirt or jacket, and drinking water. Sturdy closed-toe shoes, long pants, and a hat are recommended. Friendly dogs on a leash are welcome. DIRECTIONS: Highway 101 SOUTH from Reedsport. Turn RIGHT at John Dellenback Dunes Trailhead. in part by a grant from Travel Oregon.